The anticipated grand finale of the Guinness ‘Greatest of the Streets’ futsal championship culminated in emphatic fashion early yesterday morning at National Stadium, Providence, tarmac. 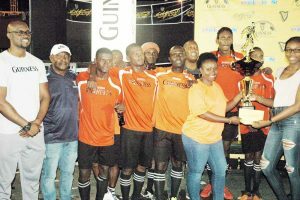 Colours Boutique Creanna Damon hands over the first prize and trophy to West Front Road ‘Gold is Money’ representative in the presence of teammates and Guinness Brand Manager Lee Baptiste (left) on Saturday. Georgetown Zone Champions, ‘Gold is Money’ became the fourth team to win both their zone and National titles in the same year and they couldn’t have done it more comfortably, especially against the likes of former Champions, Sparta Boss. Gold Is Money, led by a hat-trick from Deon Alfred, defeated Sparta Boss 4-0, a score line that could’ve easily been more embarrassing for the losing finalists who boast a very large fan base. In the 40-minute game, Randolf Wagner found the breakthrough in the 22nd minute, following a disappointing first half that saw many excellent opportunities by the eventual champions go begging. Hubert Pedro and Alfred were the main tormentors of Sparta with expert passes, touches and dribbling within the small playing space. Gold is Money, despite good defence including marking from Sparta, managed to weave circles around the opposition but lacked the finishing touch during the first 20 minutes of play. Deon Alfred then placed some cushion on the lead with a successful 33rd minute strike which was rifled in after he weaving past two defenders before he fired home a Guinness Goal (any goal that is scored within the final three minutes of play counts as two) in the 38th minute. Earlier in the night, Georgetown won the latest round of street football against Linden after prevailing in both semifinals. Silver Bullets were outclassed by Gold is Money in their semifinal and were on the receiving end of a 7-0 thumping. Deon Alfred recorded his first hat-trick of the night during that victory and he would’ve been the clear candidate for the Most Valuable Player if such an accolade was to be awarded. Hubert Pedro fired a hat-trick in that game as well while his namesake Jamal netted the final goal of the contest. In the other semifinal, Sparta Boss edged 2017 champions, Dave and Celena’s All-Stars 2-1. Current Linden Zone Champions, Silver Bullets, edged Dave and Celena’s All-Stars 2-1 in the third place playoff.